Large pale pink flowers with deeper pink towards the base of the tepals, yellow anthers.Easy and free flowering.If you don't have this one you should!! I am so happy to offer Lemon Bells again. 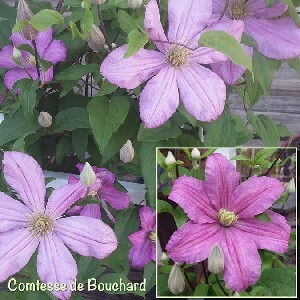 I love this clematis! Pale Yellow beefy bells with a touch of red at the base of each flower. Deep green foliage, wonderful seed heads in fall and it is well behaved. Lemon Bells blooms for a long time here in my display gardens. Cloudburst is very free flowering and easy to grow. 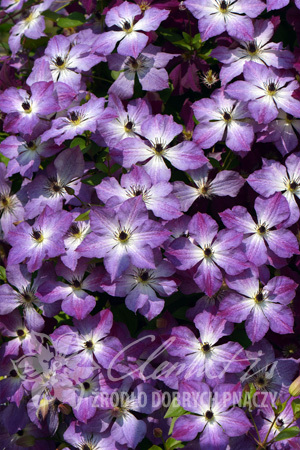 Once pruned and fed in the spring it will quickly be covered in lovely shades of purple and white flowers. This is another lovely import from Poland. 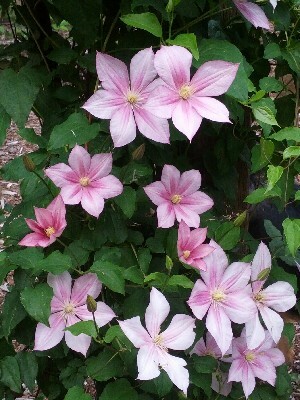 This Pink Free Flowering clematis has been a favorite in gardens since the early 1900's. It is Easy to grow and it always puts on an outstanding display. RHS award of garden merit. 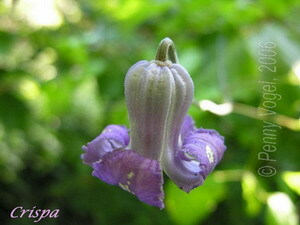 A delicate bell-shaped Clematis from the South East part of America. Purple blue with white bars on the inside.Very sweet smelling and easy to grow. Wow what a beauty this one is. Also called “Fairy Blue” Large Double Blue flowers with a creamy yellow center that looks like a fountain. Hence it’s name. A Sport of “H F Young”, made its debut at the Chelsea Flower Show in 2002. Strong growing and blooming.A must have in the garden.